Many of our patients have chosen All-on-4® dental implant surgery to replaced lost teeth. This new type of dental implant procedure helps to streamline treatment when teeth are lost as a result of age, accident, or gum disease or other dental problems. Patients wearing dentures or who are about to lose teeth can often benefit from All-on-4® treatment, working with a dentist, an oral surgeon and a qualified lab technician. Dental professionals will use radiology to determine correct placement and look at how to install implants in the mouth. The preparation for this type of innovative dental surgery is important to how the dental implants work after installation, and the patient should have a chance to participate and ask questions. The All-on-4® dental implant system gets its name from using four posts per arch in the delivery of dental implant systems. With this new type of treatment, providers can often help a patient avoid the cost and recovery of grafting into the sinuses or lower jaw. In terms of durability and dental health, the resulting implants are much more stable and permanent than temporary, removable dentures. Our patients marvel at how well dental implants work and how much better they feel when having solid, stable and long-term solutions for an aging smile. Another major benefit of the All-on-4® treatment is that in some cases, patients can have the dental implants put in on the same day that the original teeth are extracted. Think about this in terms of logistics – instead of having to install a temporary denture, when a team can place implants the same day as extractions, it adds a lot of convenience and eliminates a lot of the cost. Several stages of the traditional process are no longer required. 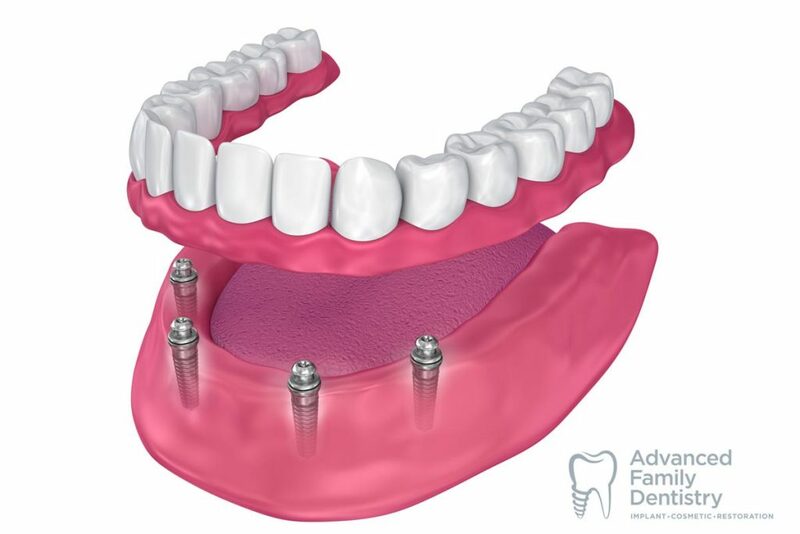 All-on-4® treatment helps a patient to get the full functionality and long-term repair of significant dental implants without the wait time, and allows them to get back to their normal life quickly. Dr. Sonny Kim will consult on what’s necessary during recovery and how All-on-4® treatment can work for you. We excel in helping our patients to understand how to pursue All-on-4® treatment and other dental options according to their oral health and specific medical history. Come talk about Advanced Family Dentistry to get dental consultation and treatment in a warm, welcoming setting and get guidance toward the best procedures for you making your smile the best it can be.